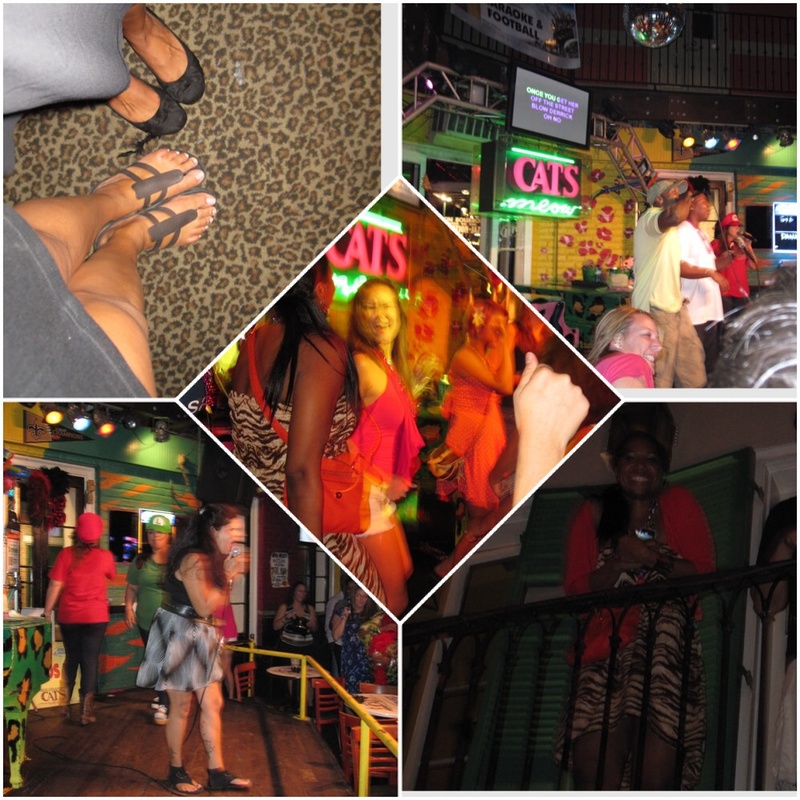 Let me start by saying that we did the majority of our bourbon street partying on a Thursday night. We passed through on Friday and I can not even begin to handle that street on a weekend. I wouldn’t have said it could get any busier, or louder, but on weekends…it does. 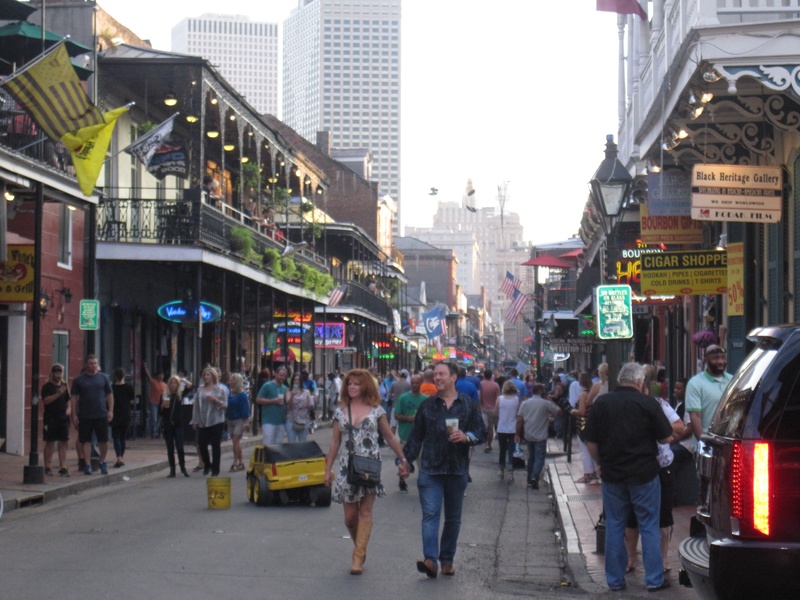 This main tourist street in the French Quarter features restos, bars and nightclubs. After dark , it is closed off and partygoers take over. There are also lots of street performers and live bands to be seen. Oh , and be aware of the balconies above you as you may just be the lucky recipient of some beads. The beads may also scare you half to death as they whiz past your head (I speak from experience)! As I mentioned in my previous post, areas Bourbon Street had a less than pleasant sewage smell. Blech. I can only imagine how this may have been if the weather was even hotter. We had to laugh when local described their 30 degree temps as a cold spell. Wonder what they’d think of Canada, eh? My sister says this smell wasn’t around when they visited NOLA in November last year, so maybe it’s a heat thing. Bourbon Street was also pretty seedy in areas, with some raunchy lingerie clad ladies (hookers? strippers? we’re still not sure) hanging outside of some clubs. In NOLA you are allowed to walk on the street with your beverage , just as long as it is in a plastic container. That makes it easy to move from venue to venue and give different spots a try. 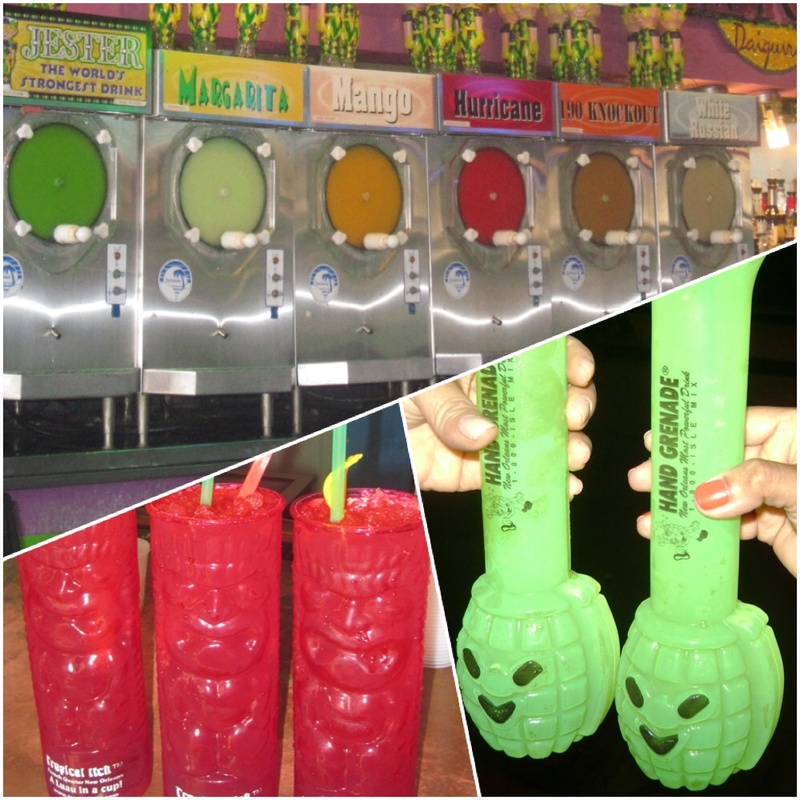 There are drinks a-plenty available on Bourbon, with hand grenades and hurricanes being the most popular. The hand grenade was easily the strongest cocktail I have ever tasted. 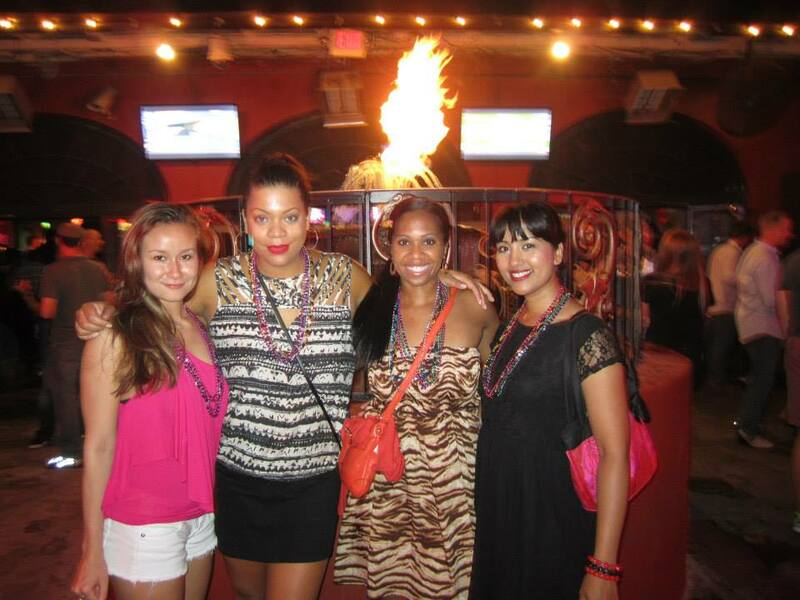 We checked out some cool spots on Bourbon Street that I would definitely recommend. 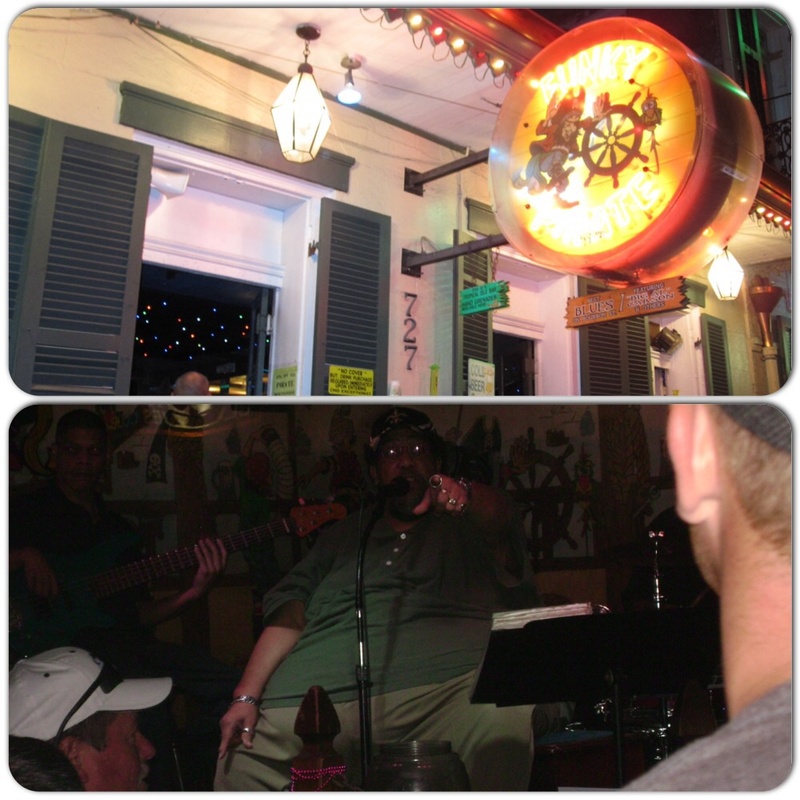 This pirate themed blues club features internationally acclaimed local talent Big Al and the Blues Masters performing nightly. Big Al is described by Funky Pirate as being, “495 pounds of pure New Orleans Blues” and he was definitely a character. He interacted with the audience in between performing rhythm and blues favourites with his smooth as silk voice. This was a great venue with a fun crowd. There is no cover and drinks are reasonably priced. At Razoo’s we caught the tail end of their house band, The Phunky Monkey’s set. They performed popular hits and the lead singer did a particularly amazing job sounding like Usher, which is not an easy feat. This venue was packed with people in the groove. Aside from the great dancing to be had, this spot deserved a mention just for its amazing patio. The back of the bar opens up into a large courtyard with a fire pit that was really nice. Also, no cover and free jello shots. Sounds good, right? In addition to partying it up a bit, we also went on three incredible tours that I would highly recommend for anyone visiting New Orleans. I am so glad that we did these as we learned a great deal about the history of this incredible place. It was also a nice balance to the Bourbon party scene. We could not possibly come to Louisiana without seeing the gators! This tour was $50 and included pickup near our hotel. It would be $30 without transportation , but since the bayou was about an hour away the bus was worth the extra money. 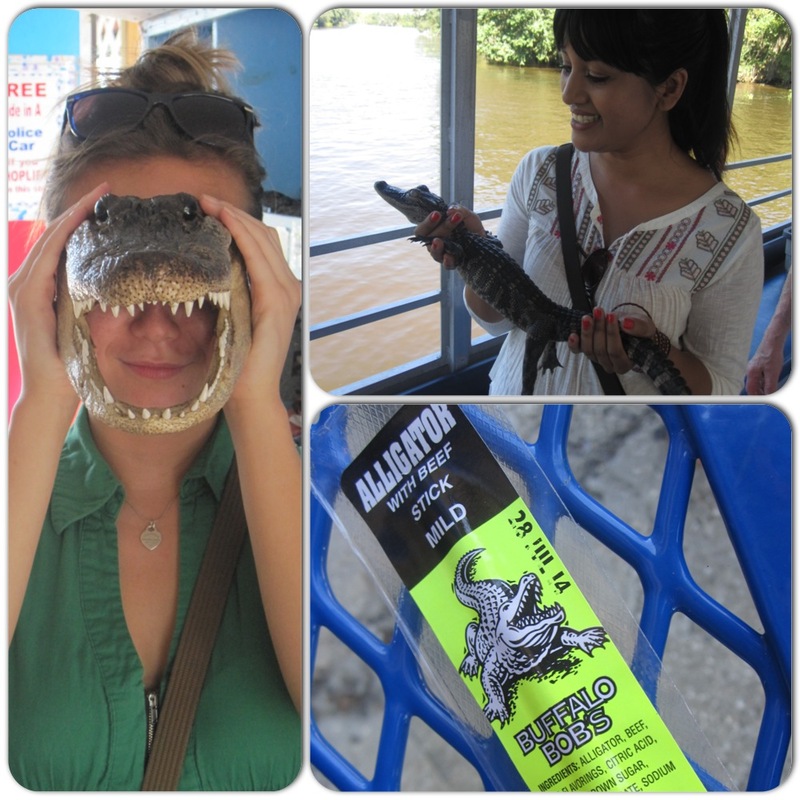 The swamp tour is fully narrated by a captain who was native to the Barataria Swamps with a background of gator hunting, fishing and trapping. Our guide was hilarious and he certainly amazed up with his extensive knowledge of the swampland. 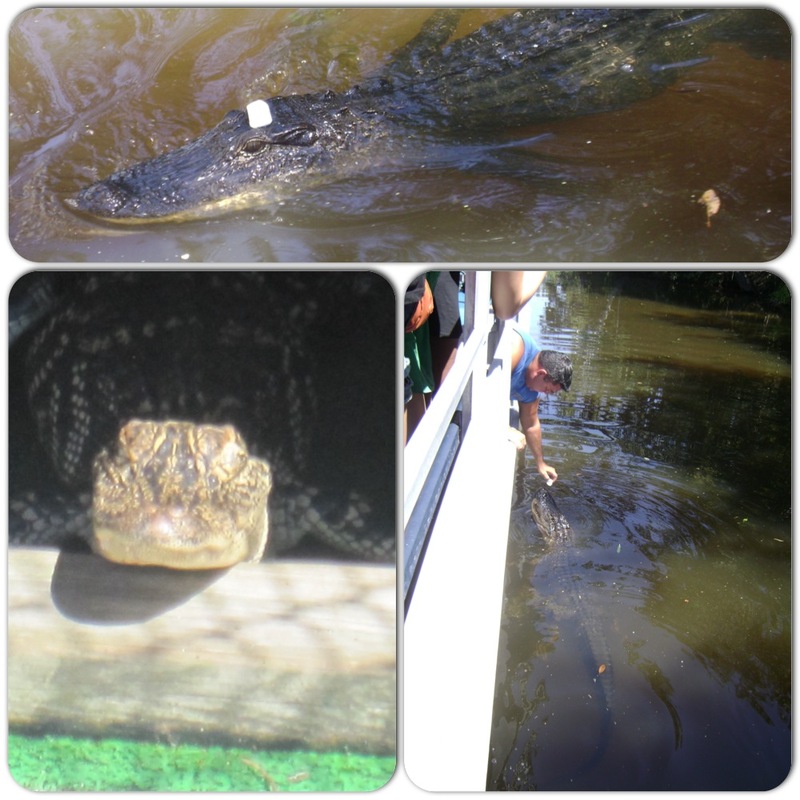 We sure did see some gators on our tour. In fact , they swam right up to the boat when our guide fed them. Bet you can’t guess what the gators are fed? Apparently marshmallows not only smell and taste good but they are easily digested by the alligators. Our guide even hand fed one. A little to risky if you ask me. Have you seen those teeth?! Much to our surprise/ my terror, there was a little guy on board with us. We got to hold him and I must say…he was kind of sort of cute. A) I can’t begin to tell the stories with the detail and accuracy of our incredible tour guides. I could not do them justice. B) I do not want to ruin it with spoilers for anyone who may be taking either of these tours in the future. Amazingly eerie. 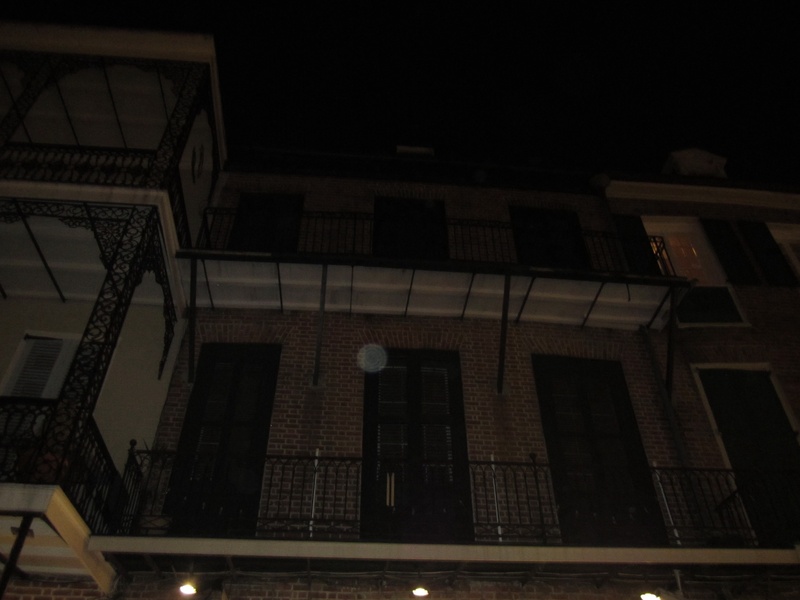 The French Quarter of New Orleans is an area with a dark history that has reportedly made it a hotbed of paranormal activity. The Haunted History tours have been featured on A&E, Discovery, The History Channel, and has been recommended by The Travel Channel as the #1 tour in New Orleans. Haunted History Tours has also published a bestselling book entitled New Orleans Ghosts, Voodoo and Vampires. The ghost tour that we did was $25 and worth every penny. On this walking tour, we were led through the French Quarter as our guide Wendy told us stories of ghosts and showed us their haunts. A particularly chilling story was that of Delphine Lalaurie who tortured and killed dozens of slaves at her home in the French Quarter. The Lalaurie mansion is said to be both haunted and cursed now. Actor Nicholas Cage purchased the home in 2007. Shortly after he went bankrupt. Cage never spent a night in the mansion. Kathy Bates will be portraying Delphine Lalaurie in the upcoming season of the television show, American Horror Story. I can’t wait to watch! 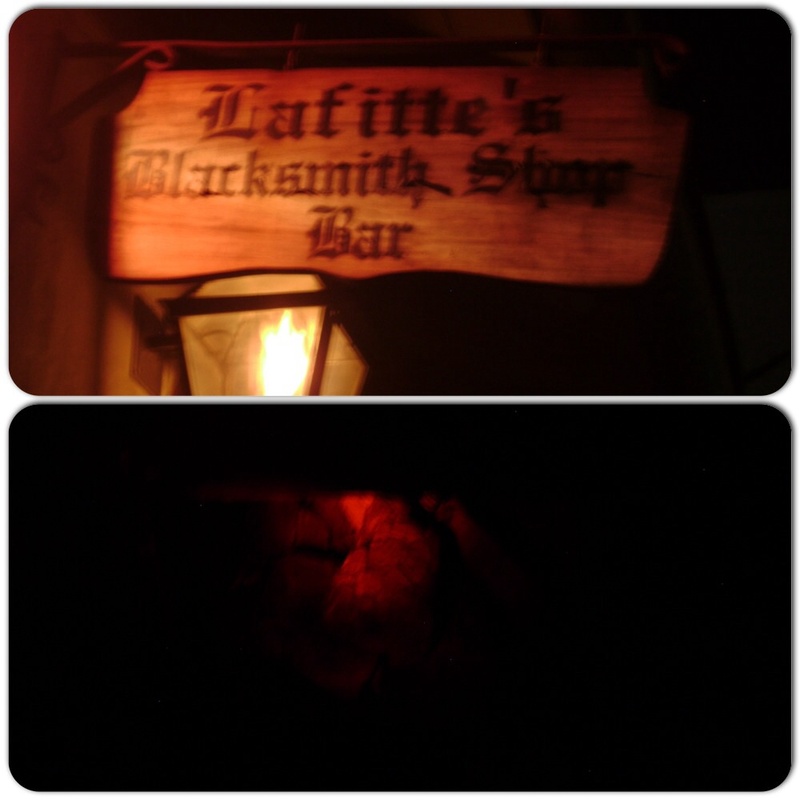 In addition to the Lalaurie house, we also visited the site of the John Lafitte Blacksmith Shop. This building is now a bar that two known entities are now known to haunt. There is a fireplace in the bar that is said to be the location of some creepy sightings, including red eyes that staff and patrons have reported. In one of our pictures, the fireplace glowed red, although there was no fire. 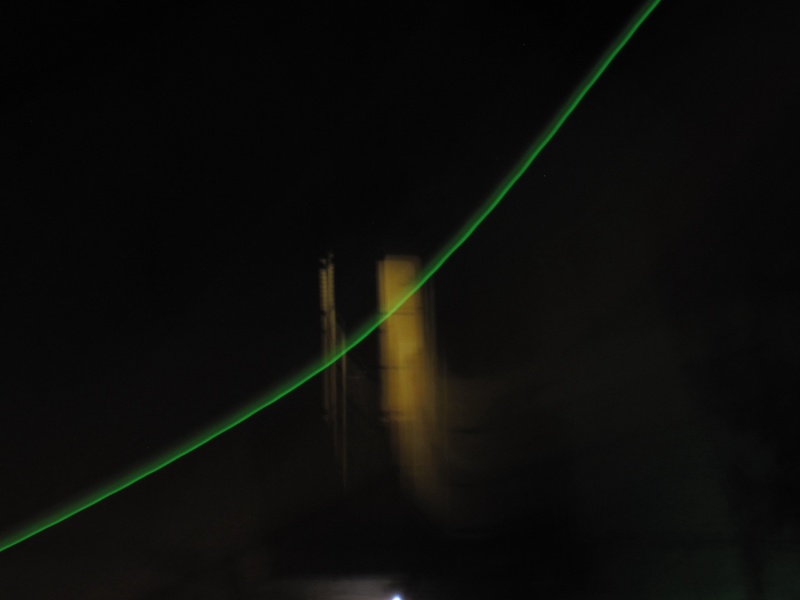 We learned that paranormal activity can be seen in pictures as hazy figures, smoke and orbs. A good clue is that these are present in some pictures but not others taken right after. Also common is cameras losing battery in a haunted area, and it becomes fully charged again when they leave. Here are a couple of our freaky deaky pics. It is difficult to pick a favourite of the amazing tours that we went on , but this might just be it for me. I say this because it was definitely the one where I learned the most. The voodoo cemetary walking tour is $19 well spent. I knew very little about voodoo before this trip, but quickly learned that it was very popular in New Orleans. This tour dispelled many of the myths about Voodoo that I have seen on television and in movies. I learned that it is actually a really beautiful practice with a rich history. 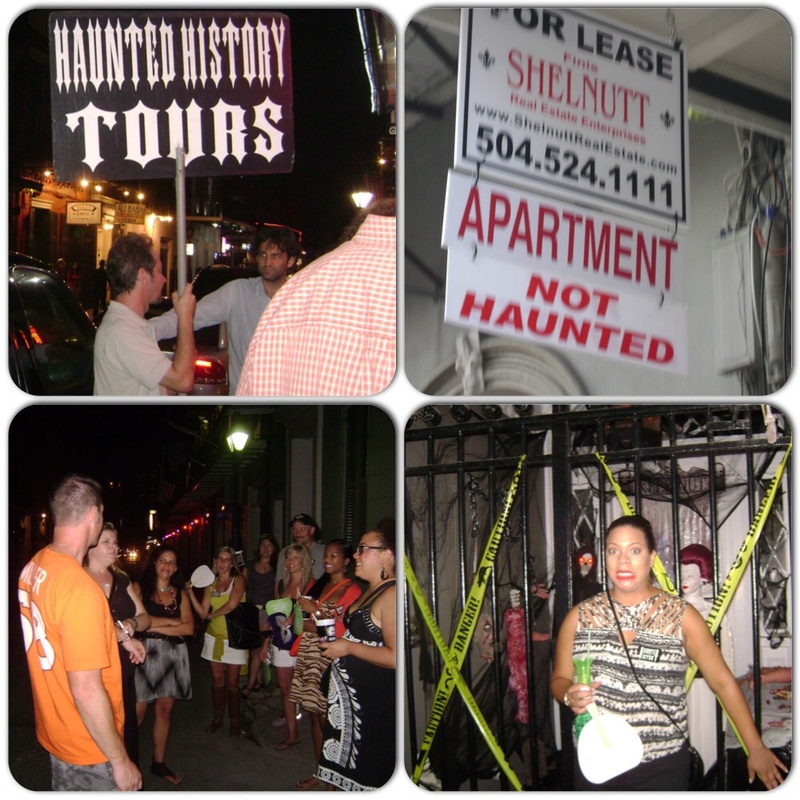 This tour is operated by the New Orleans Historic Voodoo Museum. We were lucky enough to have the museum’s owner, Jerry Gandolfo as our tour guide. Jerry’s extensive knowledge and passion for voodoo history was incredible. Marie Laveau is known as the Voodoo queen of New Orleans. She will be played by Angela Bassett on American Horror Story! 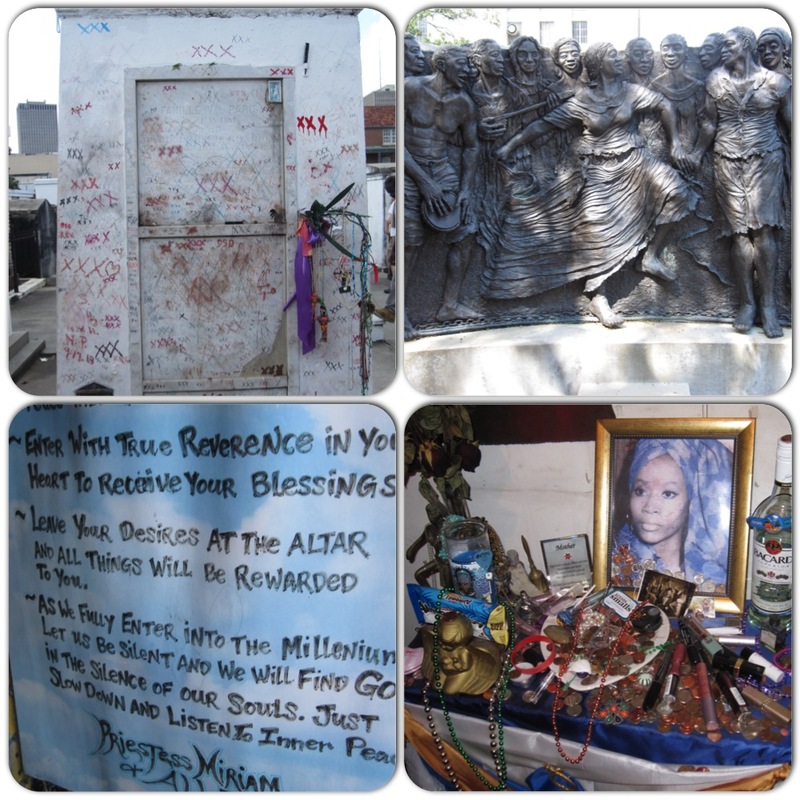 When Marie Laveau was alive, visitors would knock on the door of her home to have intentions answered. Since her death, visitors knock on her tomb instead. 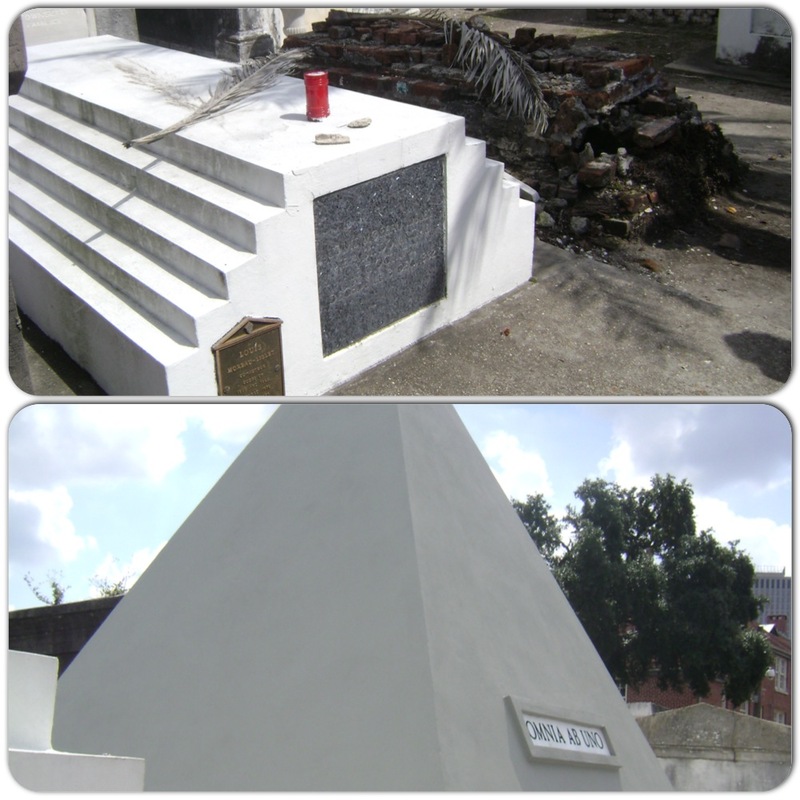 We visited the tomb of Marie Laveau and were given a full tour of St.Louis cemetary. On our way to the cemetery , we visited Congo Square where Voodoo rituals and ceremonies would take place, visited The Church of St. Jude and had the incredible opportunity to meet and talk to a lovely and wise contemporary Voodoo priestess, Miriam. This was a very full tour. We learned about Voodoo as the “dancing” religion, Voodoo and the creation of Jazz, rituals, gris-gris, Voodoo Queens, zombies, the reason for jazz funerals, how Voodoo hides in plain sight, the connection to Mardi Gras, and the relationship between Voodoo and the Catholic Church. The pyramid tomb above was built by…you guessed it…Nicholas Cage! He would like his final resting place to be at the St. Louis cemetary. Be prepared for a long day with this tour. It was scheduled to be about 2.5-3 hours but it ended up being over 5! Although we were a bit hot and hungry, we didnt mind. Jerry is a wealth of knowledge and just being able to learn from him was a treat. As I mentioned, my descriptions of these tours don’t do them justice. They were all fantastic and I am glad to have had the opportunity to take them. New Orleans is truly a magical place. It is rich in history and legend but also an incredible party city. In my opinion, no visit is complete without a taste of both. 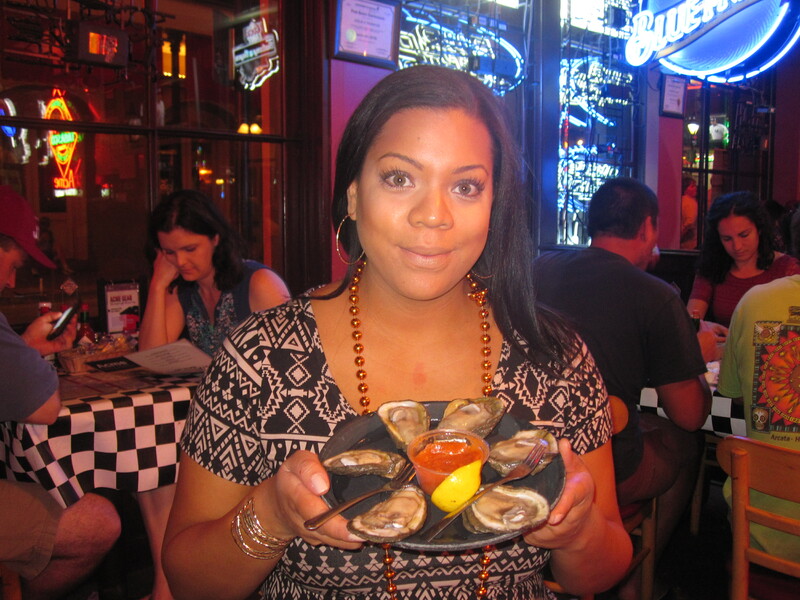 Speaking of taste, my next post will have you salivating as I will be sharing all of the delicious NOLA eats. Yum! If you have been to any of the hot spots, or done any of the tours that I have mentioned, I would love to hear about it below! Love this post! The Voodoo tour was also the highlight of the trip for me – it has been a life-long interest of mine, and it was such a privilege to learn more from Mr. Gandolfo. It is so important to dispell the myths and inaccuracies so often associated with the practice. I totally agree with you that no matter how jam-packed the days were, there is yet so much to see and do…sooo I guess we have to go back soon! 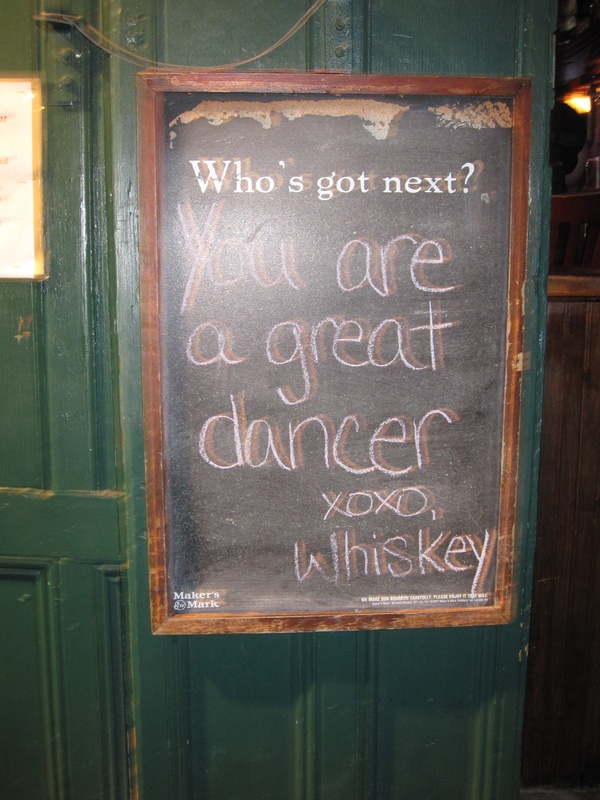 I have loved reading your NOLA posts, and I am anciously awaiting your next post. I love Vegas! I can’t compare it. But that is also because my bff lives there. The two cities are really different. You need to do BOTH.